Here's a tasty meal that can be served over rice noodles or brown rice. Mix soy sauce, rice vinegar, ginger, Stevia and red pepper flakes. Pour over steak and let marinate at least 5 to 10 minutes. Heat olive oil in large non-stick pan. Drain beef cubes and sauté in pan until medium rare (about 1 to 2 minutes). Add chopped onion to pan and sauté for 3 minutes until soft and tender. 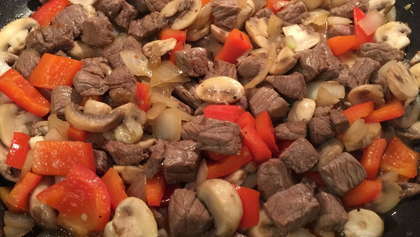 Add mushroom and bell pepper and cook until veggies are fork tender. Add back the beef and season with salt and pepper. Serve over bed of rice noodles or whole grain brown rice.